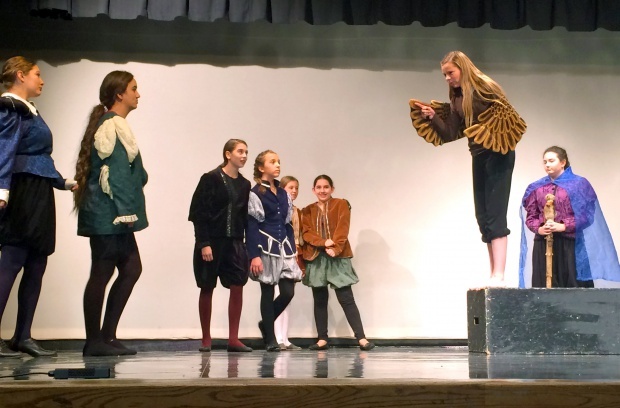 For two months, Dixon students attended rehearsals several times a week to produce this year’s Fall Plays “The Mish-Mosh Bird” and “The Tempest”, which ran Thursday, November 5; Friday, November 6; and Monday, November 9. Each night drew over 100 people, students and parents alike, with the largest crowd Monday night with 160 people in attendance. A scene from “The Mish Mosh Bird”. “The Mish-Mosh Bird” is a comedy set in the 1960’s and revolves around a family whose lives are upended when the mother, played by Hailey Little, unsuspectingly buys a rare ‘Mish-Mosh’ bird in a pet store. The bird is not only able to speak, but can predict the future, and this draws huge crowds and press to their modest home; much to the chagrin of her husband, played by Mason Robinson, and two children (Alyssa Lunt, Hyrum Ashworth). From left: Alyssa Lunt, Hailey Little, Mason Robinson, and Hyrum Ashworth. 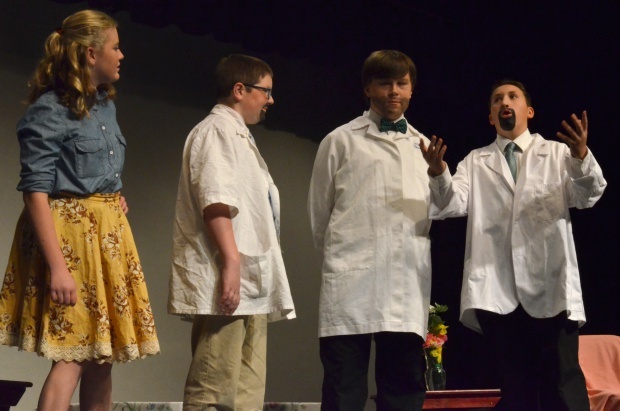 Some of the most humorous characters were three scientists who flock to our protagonists’ home to study the rare bird, played by Luke Peay, Ben Hults, and Joseph Jenks. The scientists discussing the Mish-Mosh bird with the family’s mother. From left: Hailey Little, Joseph Jenks, Ben Hults, and Luke Peay. Shakespeare’s “The Tempest” was the second play of the evening, providing a different flavor than “The Mish Mosh Bird”. The classic play tells the tale of a Duke named Prospero, played by Hallie Gee, who was many years ago wrongfully outcast and shipwrecked on an island and now has the opportunity to bring justice to those that wronged him. 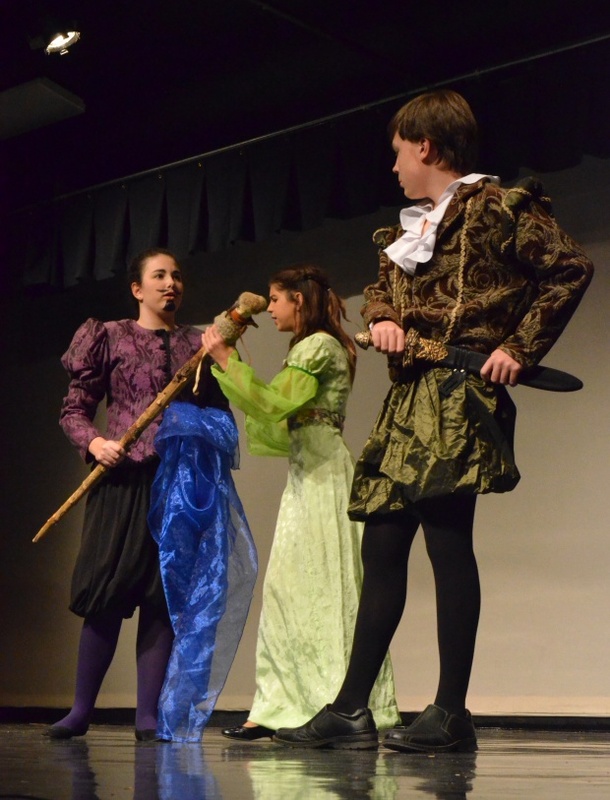 Hallie Gee, left, as Prospero; Lyteesia Lamb as Miranda, center; and Milo Hults as Ferdinand. Prospero achieves his revenge this through use of magic and the assistance of a spirit named Ariel (Lucy Ashton), who among other things helps him shipwreck the King Alonso (Maddie Eagan) and his treacherous brothers Antonio (Tristan Blanchard) and Sebastian (Sophia Luke). To guarantee his success, he arranges for his daughter, played by Lyteesia Lamb, to fall in love and marry the prince Ferdinand, who was played by Milo Hults. 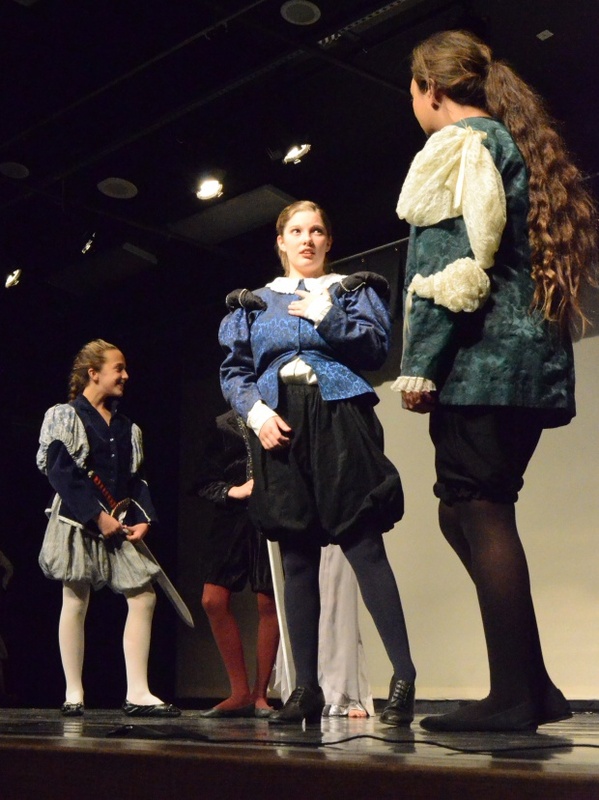 Maddie Eagan, center, as King Alonso discussing matters with her advisor Gonzolo (Katie Tuinei) shortly after thwarting a new dastardly scheme from Sebastian (Sophia Luke) and Antonio (Tristan Blanchard). The most active characters on the stage in this play were Carter Coates’ character Caliban, a foul-spirited native to the island, and the light-hearted shipwrecked drunks Trinculo (Emma Jensen) and Stephano (Emily Jensen). 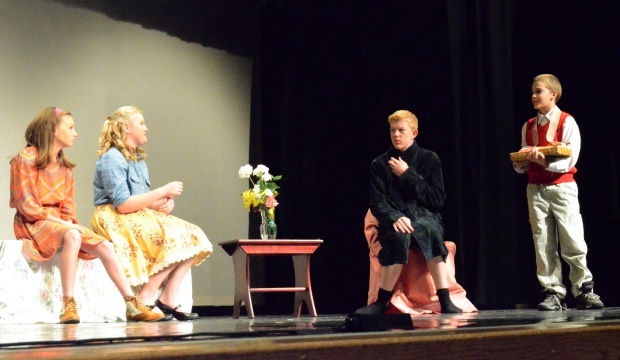 During the last rehearsal, Carter injured his back, but was thankfully able to recover enough by Thursday to perform his role. 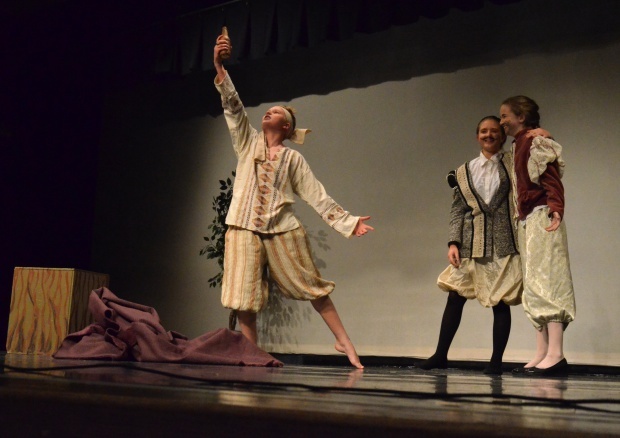 Carter Coates, left, as Caliban, and Emma and Emily Jensen as Trinculo and Stephano. 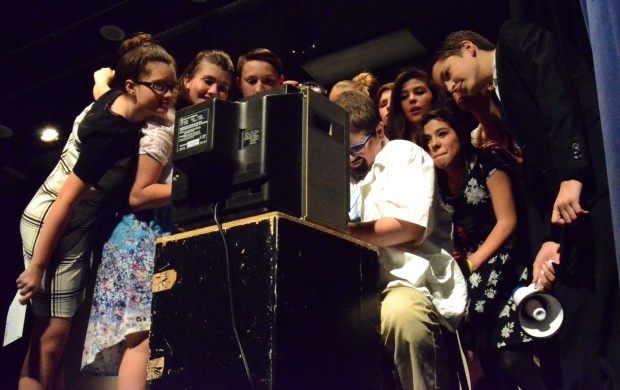 The plays were directed by Nicole Marriott, Dixon’s drama teacher, and were assisted in direction by science teacher Holly Tippets. Costumes and props were largely put together by art teacher Chelsea Cellar. The shipwrecked crew are threatened by the spirit Ariel disguised as a harpy, as Prospero looks on. For Ms. Marriott, the work doesn’t end with the Fall Play. This coming Monday, November 16, auditions for the spring musical “Pirates of Penzance” begin. Any student interested in auditioning should come prepared Monday after school with a musical piece to sing, and return Tuesday to perform an acting part.